Philippe Petit is such an interesting man. 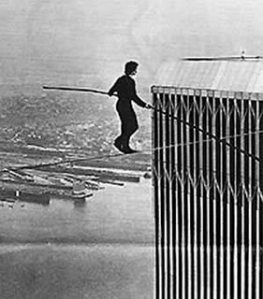 He is a Frenchman best known for his tightrope walks including his famous wire walk in 1973 between the World Trade Center Towers. As we approach the anniversary of 9/11 let us reflect on the best of the human spirit, something that Philippe has in abundance. Watch a bit of the man himself. By inspiring himself, he indeed inspires us too. Somehow I missed watching the documentary film. I plan to do so – yes, such energy and spirit.